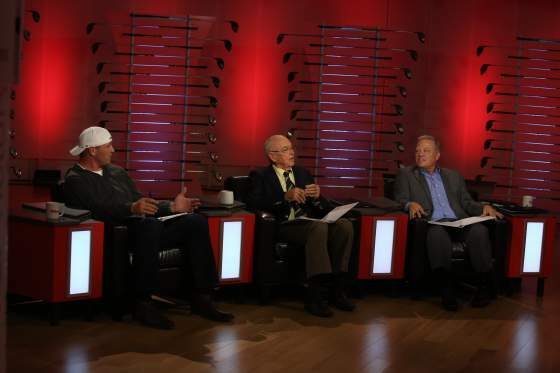 CHICAGO, January 13, 2015 – Wilson Golf announced today the panel of judges and host for Driver vs. Driver, a first-of-its-kind television series that is currently in production and debuting on Golf Channel in Fall 2016. Leading the four-person panel is former National Football League® (NFL) linebacker Brian Urlacher, an avid golfer with a single-digit handicap and a self-professed golf equipment “junkie.” Urlacher retired in 2013 after a 13-year career in the NFL, and now he has turned his competitive focus to the golf course. Alongside Urlacher will be Kevin Streelman, a two-time PGA TOUR winner and Wilson Advisory Staff Member; Frank Thomas, former USGA Technical Director with more than 40 years of golf technology and equipment experience; and Tim Clarke, President of Wilson Golf. Sports broadcaster Melanie Collins will serve as the host of Driver vs. Driver. Currently a sideline reporter for CBS’ college football and basketball coverage, Collins formerly served as a co-host for Golf Channel’s competition series, Big Break. Production for Driver vs. Driver began in the Fall of 2015 and will continue through the summer. The series is being produced by Golf Channel, whose portfolio of original productions include interview series Feherty hosted by Emmy-nominated sports personality David Feherty, high-quality instruction shows The Golf Fix, School of Golf, Golf Channel Academy and Playing Lessons and a slate of award- winning documentaries and films. A first look preview of Driver vs. Driver will air on Golf Channel’s Morning Drive live from the PGA Merchandise Show in Orlando, Florida on January 28. For more information, log on to www.wilson.com/drivervsdriver. Golf Channel is a multimedia, golf entertainment and services company based in Orlando, Fla. Serving the most-affluent audience in all of television, Golf Channel – co-founded by Arnold Palmer in 1995 and now part of NBC Sports Group – is available in more than 200 million homes in 84 countries and 11 languages around the world. Golf Channel features more live golf coverage than all other networks combined, including tournament action from the PGA TOUR, LPGA Tour, The Open Championship, Olympics, and Ryder Cup, as well as high-quality news, instruction and original programming. Golf Channel’s digital platforms, headed by GolfChannel.com, are leading golf digital destinations, delivering unmatched coverage of the world of golf. Fans are able to enjoy 24/7 live streaming of Golf Channel content through Golf Live Extra and NBC Sports Live Extra and select programming is simulcast via SiriusXM’s PGA TOUR Radio. In addition, Golf Channel connects the world to golf through a wide array of digital and lifestyle services including Golf Channel Mobile, a comprehensive app covering golf’s latest headlines, scores and analysis; GolfNow, the world’s largest online tee time booking platform and golf course technology partner, which includes the GolfNow Mobile App, featuring on-course GPS tracking, in-round scoring and game tracking; GolfAdvisor.com, the world’s largest golf course ratings and review resource for golfers, by golfers; a North American network of Golf Channel Academy instructional facilities; and Golf Channel Am Tour, the world’s largest amateur golf tour.